KAOHSIUNG, Taiwan 16/03/2018　– Taiwanese baseball legend Chung-yi HUANG will be showcasing WBSC Mini Baseball/Softball and helping to unveil the new inflatable WBSC Mini Ballpark to thousands of young boys, girls and fans this weekend (17-18 March) at Kaohsiung Arena. 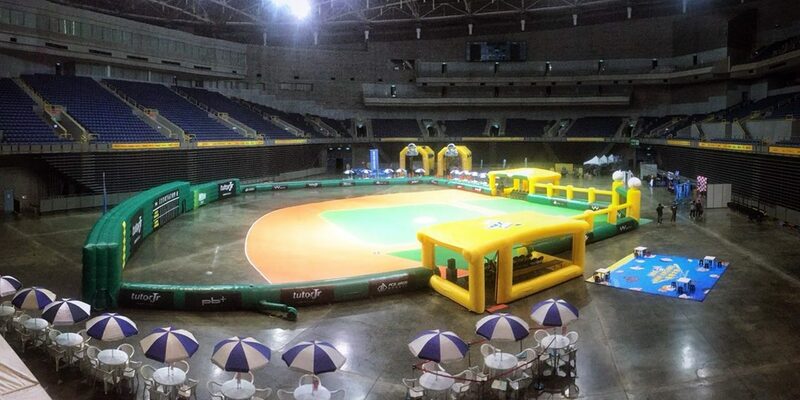 The inflatable WBSC Mini Ballpark has been designed to introduce the game to children and newcomers, by providing an exciting and real experience within a safe environment. Leaders from the WBSC and Chinese Taipei Baseball Association are looking to promote the new “mini” discipline to attract the next generations and further advance baseball’s position as the top spectator sport in Taiwan, and to expand the game in other Chinese-speaking territories, such as China, before launching worldwide. Huang, a fan-favourite during his career, will lead games and offer instruction to the youth of Kaoshiung, which has a population of 2.77 million. Huang was a 1992 Olympic silver medallist with the Chinese Taipei and starred 13 years in Taiwan’s top-tier league, the Chinese Professional Baseball League (CPBL). The weekend’s activities are free of charge and open to the public. For more information, visit the official WBSC Mini Baseball website at http://minibaseball.yysports.com/en.